Welcome to LGP! “Loving God and People” middle school ministry is a place where students and staff alike strive to live up to our title. It is our desire to love God with our whole heart and cherish our neighbors as ourselves; take a look at Matthew 22:36-40. Our vision is to love God and others through forms of worship, discipleship, service, evangelism, and fellowship. As we strive to seek God, He has been gracious to grant us tons of fun in the process! We meet in the middle school room (D-28) at church. Our gathering is from 6:30-8:00pm. Includes games, worship, Bible message, and small groups. 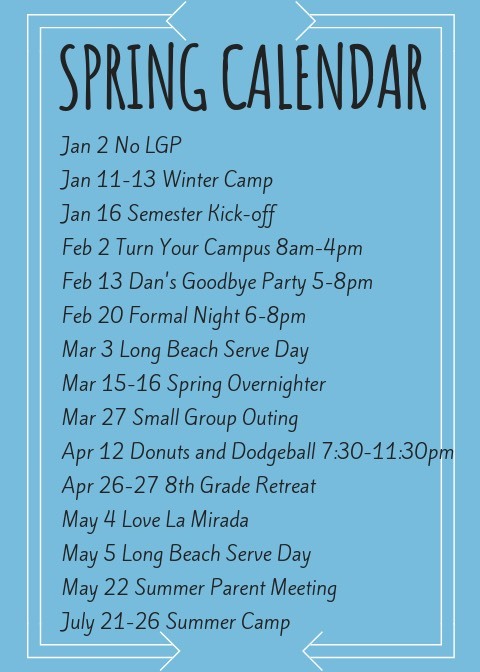 A list of this semester's Games & Themes is soon to come! We meet in the middle school room, next to D-20. We meet for Sunday school from 9:45-10:45am. We are currently studying the gospel of Mark. Sunday school emphasizes connection and the Word. Click on Spring Events for a list of our events for the fall. who pour into the lives of our middle school students on a weekly basis. Devin is our amazing Pastoral Intern within the middle school department. He has been serving on middle school staff for over five years now, and he recently earned his M.Div. from Talbot School of Theology. He demonstrates an excellent balance between spiritual maturity and middle school energy. He has a passion for ministry and young people. He also brings many years of youth camp experience into the middle school group which elevates the intentionality and excitement of the ministry. Along with being our official Biola Intern through the Christian Ministries Department, Sara is beginning her third year on the LGP team. She adds to the diversity of the group, being a Colorado native and a brilliant Torrey student. We are excited for the girls who will have Sara in their small group this semester because she brings love and depth to her ministry. Papa John represents the best of both worlds: he is both a leader in the middle school ministry and a dad. He is greatly loved by his small group who affectionatly gave him the title "Papa" John. He has more excitement in his pinky finger than most of us have in our entire bodies: he'll compete, he'll cheer, he'll dance, and if you're lucky, he'll even share from the abundance of his candy supply! Joseph has been serving middle school students at Granada for over a year now, and he is still the freshest addition to the LGP team! After serving at a high school camp in Germany and then our middle school students at Thousand Pines Christian Camp this summer, Joseph is ready to jump back into the routine this school year. He is beginning his sophomore year at Biola, and he is excited to see where God will take him in the field of education. We are blessed to have Joseph serving our middle school students with passion and excellence yet again this year! The lovely Megan Litz has reunited with the LGP team after a few years off. She is an experienced middle school teacher, and currently runs her own tutoring business helping students with dyslexia. She is just about the most thoughtful, patient, and generous woman you will ever meet. These traits which translate into a deep love for students make for a great leader. Noelle is the newest member of our LGP squad. She loves being outdoors, and sharing the joy of nature and God's creation with others. She has experience working with middle school students from both the science camp setting and when she was teaching at the Aquarium of the Pacific. She is currently working at Biola and is excited to be a part of the middle school ministry here at Granada. To become a leader in the middle school ministries at Granada Heights Friends Church, please print & fill out our application as well as read through our covenant. The covenant will explain the expectations and roles of a student ministries volunteer. Any questions or concerns you may have are more than welcome, and we'd love to talk to you about them! Contact Duane Litz for more information on becoming involved in our ministry.